3 Laurent Fignon (Renault-Elf) 1'59"
4 Acacio Da Silva Mora (Malvor-Bottecchia-Vaporella) 2'16"
5 Yvon Madiot (Renault-Elf) 3'34"
6 Emanuele Bombini (Del Tongo-Colnago-Samet-Candy) 3'37"
7 Mario Beccia (Malvor-Bottecchia-Vaporella) 3'43"
8 Jörg Müller (Skil-Sem-KAS-Miko) 3'55"
9 Eric Van Lancker (Fangio-Marc-Mavic-Ecoturbo-Alan) 3'59"
10 Pascal Poisson (Renault-Elf) 4'02"
11 Jean-Marie Wampers (Hitachi-Splendor-Sunair-Marc) 4'03"
12 Ludo Peeters (Kwantum-Decosol-Yoko) s.t. 13 Davide Cassani (Santini-Krups-Conti-Galli) 4'09"
14 Joop Zoetemelk (Kwantum-Decosol-Yoko) 4'11"
15 Rolf Gölz (Del Tongo-Colnago-Samet-Candy) s.t. 16 Jesper Worre (Sammontana- Bianchi) 4'13"
17 Teun Van Vliet (Verandalux-Dries-Rossin-Nissan) s.t. 18 Hubert Seiz (Cilo-Aufina-Magniflex) s.t. 19 Jean-Marie Grezet (Cilo-Aufina-Magniflex) s.t. 20 Stephen Roche (La Redoute-Cycles MBK) s.t. 21 Sean Kelly (Skil-Sem-KAS-Miko) s.t. 22 Steven Rooks (Panasonic-Raleigh) s.t. 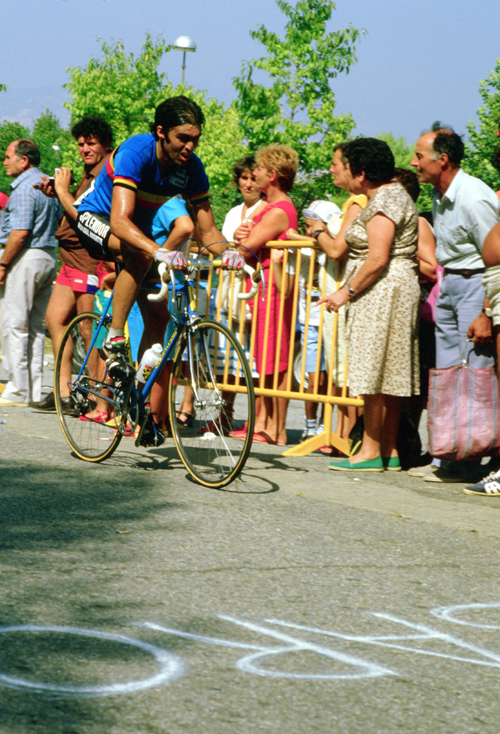 23 Bernard Hinault (La Vie Claire-Wonder-Radar) s.t. 24 Denis Roux (Renault-Elf) 4'20"
25 Niki Rüttimann (La Vie Claire-Wonder-Radar) s.t. 26 Jan Nevens (Kwantum-Decosol-Yoko) 4'25"
27 Ad Wijnands (Kwantum-Decosol-Yoko) 4'27"
28 Ronny Van Holen (Safir-Van de Ven-Colnago) s.t. 29 Steve Bauer (La Vie Claire-Wonder-Radar) s.t. 30 Gérard Veldscholten (Panasonic-Raleigh) s.t. 31 Bernard Vallet (La Vie Claire-Wonder-Radar) s.t. 32 Fabrizio Verza (Sammontana-Bianchi) s.t. 33 Pascal Simon (Peugeot-Shell-Michelin) s.t. 34 Martial Gayant (Renault-Elf) s.t. 35 Michel Dernies (Lotto-Merckx-Campagnolo-Vermarc Sport) s.t. 36 Gilles Mas (Skil-Sem-KAS-Miko) s.t. 37 Raoul Bruyndonckx (Eurosoap-Crack-Diamant-Datakor) 4'39"
38 Cesare Cipollini (Maggi Mobili-Fanini Cicli) s.t. 39 Henk Lubberding (Panasonic-Raleigh) s.t. 40 Christian Jourdan (La Vie Claire-Wonder-Radar) s.t. 41 Robert Millar (Peugeot-Shell-Michelin) s.t. 42 Eric Caritoux (Skil-Sem-KAS-Miko) s.t. 43 Paul Haghedooren (Lotto-Merckx-Campagnolo-Vermarc Sport) 4'44"
44 Joel Pelier (Skil-Sem-KAS-Miko) s.t. 45 Alberto Volpi (Sammontana-Bianchi) s.t. 46 Philippe Chevallier (Renault-Elf) 4'49"
47 Peter Winnen (Panasonic-Raleigh) s.t. 48 Jens Veggerby (Maggi Mobili-Fanini Cicli) s.t. 49 Toine Poels (Kwantum-Decosol-Yoko) 4'54"
50 Tommy Prim (Sammontana-Bianchi) s.t. 51 Francesco Cesarini (Del Tongo-Colnago-Samet-Candy) s.t. 52 Eddy Schepers (Lotto-Merckx-Campagnolo-Vermarc Sport) s.t. 53 Tullio Bertacco (Sammontana-Bianchi) 5'00"
54 Ludo De Keulenaer (Panasonic-Raleigh) s.t. 55 Valerio Piva (Sammontana-Bianchi) 5'04"
56 Pierre Bazzo (Fagor) 5'06"
57 Marco Vitali (Del Tongo-Colnago-Samet-Candy) s.t. 58 Maurizio Piovani (Del Tongo-Colnago-Samet-Candy) s.t. 59 Johan Lammerts (Panasonic-Raleigh) s.t. 60 Alf Segersall (Sammontana-Bianchi) 5'17"
61 Uwe Bolten (Verandalux - Dries-Rossin-Nissan) 5'28"
62 Claudio Fasolo (Santini-Krups-Conti-Galli) 5'50"
63 Dominique Garde (Skil-Sem-KAS-Miko) s.t. 64 Jan Van Camp (Verandalux-Dries-Rossin-Nissan) 5'55"
65 Dag Otto Lauritzen (Peugeot-Shell-Michelin) 9'25"
66 Martin Kemp (Nikon-Van Schilt-Elro-Colnago) 18'35"
67 Maarten Ducrot (Kwantum-Decosol-Yoko) s.t. 68 Laurent Biondi (Hitachi-Splendor-Sunair-Marc) s.t. 69 André Massard (Cilo-Aufina-Magniflex) s.t. 70 Giuseppe Saronni (Del Tongo-Colnago-Samet-Candy) s.t. 71 Heinz Imboden (Cilo-Aufina-Magniflex) s.t. 72 Philippe Delaurier (La Redoute-Cycles MBK) s.t. 73 Stefan Morjean (Tonissteiner-Torhout Werchter-BASF) s.t. 74 Peter Schroen (Skala-Gazelle) s.t. 75 Jules Dubois (Tonissteiner-Torhout Werchter-BASF) s.t. 76 Patrick Cocquyt (Safir-Van de Ven-Colnago) s.t. 77 Bert Wekema (Panasonic-Raleigh) s.t. 78 Filippo Piersanti (Maggi Mobili-Fanini Cicli) s.t. 79 Johnny Broers (Skala-Gazelle) s.t. 80 Jacques Bossis (Fagor) s.t. 81 Léo Van Vliet (Kwantum-Decosol-Yoko) s.t. 82 Secondo Volpi (Malvor-Bottecchia-Vaporella) s.t. 83 Patrick Verschueren (Safir-Van de Ven-Colnago) 18'40"
84 Doug Shapiro (Kwantum-Decosol-Yoko) 18'42"